Don’t put up the mower yet. Although turf grasses have stopped growing, you can use the mower to chop up and recycle the leaves back into the lawn or for a compost pile. Prepare gas-powered engines for winter. The owner’s manual is the best guide to winterizing a lawn mower, tiller, garden tractor or other power equipment. Drain and store garden hoses and watering equipment in a readily accessible location. Lawns and other plants may need an occasional watering during prolonged dry spell. In general, once the weather gets and stays cold, pruning of deciduous plants (ones that lose their leaves) can be safely done. 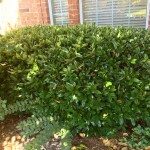 Evergreen hedges can be sheared or cut back in the winter also. Wait until February to prune your roses. Remember – Do Not Top your Crapemyrtles! Simply prune to remove seed heads and shape. Prepare for the cold weather before it hits! One of the best things you can do for your landscape plants is to provide a 2 to 3 inch layer of mulch. Mulching is necessary year round but during the colder periods it provides a layer of insulation for the roots. Water your landscape well before a cold spell. A drought stressed plant is more susceptible to freeze damage. For more tender plants, purchase frost cloth for extra protection. Cover the plant completely allowing the edges to come all the way to the ground, utilizing the heat which radiates from the ground. December is a perfect time to plant trees and shrubs so they can develop a strong root system for next Spring. Cool weather color such as Pansies, Snapdragons, Cyclamen, Flowering Cabbage and Kale add splashes of color to your landscape. Spring flowering bulbs can be planted now once they have been properly chilled. Make your home beautiful for the Holidays with a stunning assortment of floral quality Poinsettias, Cyclamen, freshest greenery and Christmas Trees. Add a mix of new indoor and tropical plants to energize your home décor. Remember to provide food and water for the birds this winter. You can attract just as many birds with a bird bath as with food, especially during the dry spells. To draw a diversity of birds provide a variety of seeds, like sunflower, thistle, safflower and millet; plus suet. Once you begin putting out bird food, continue feeding them through the spring time. This entry was posted on Sunday, November 18th, 2018 at 11:22 am	and is filed under News & Updates. You can follow any responses to this entry through the RSS 2.0 feed. Both comments and pings are currently closed.